In Gran Turismo form, BMW's 3 Series offers five-door hatchback versatility and much more rear seat space along with a more unique look and a slightly raised Crossover-style feel. The extra height and weight these changes bring create a different kind of drive but families probably won't mind. This, after all, is the most practical compact model the Munich maker has ever brought us. Let's check out this lightly improved version. So, let me make sure I've understood this correctly. You like the idea of a BMW 3 Series saloon, but it's not big enough in the boot. You like the idea of a 3 Series Touring estate, but it isn't roomy enough for those in the rear. And you like the idea of the 3 Series-based X1 crossover model, but it's not sharp enough to drive. At least we've established you want a 3 Series - possibly this one, the 3 Series Gran Turismo. 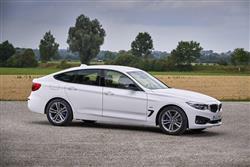 A 3 Series with a hatchback then, and an example of the breed that was first launched here back in the Summer of 2013 as a variant of this model line aiming to be fine for families, provided they can afford it. A BMW with the higher stance and commanding driving position of a small crossover - but one you can still enjoy driving. And a compact car that doesn't feel like one when you stretch out inside it. Such is the rationale behind this, Munich's smallest Gran Turismo model. A bit of a niche product? Yes, but one you could see appealing to plenty of people. Packaged up neatly here are attributes that BMW claim to have carefully pitched to suit the Qashqai crowd, the station wagon set and people for whom perfection is a compact executive saloon. A car for all seasons and all reasons then? Or a compromise best forgotten? Let's check out the subtly improved version of this car and find out. So. Just how will this GT drive? It's hard to think of any car ever sold whose driving dynamics were improved by making it longer, higher and heavier. So there's reasonable scope to fear that the traditionally magnificent 3 Series driving dynamics may have been irrevocably corrupted here by a higher centre of gravity - you sit as high up as you would in BMW's X1 SUV - and a 145kg weight penalty over the saloon model. In the event, we don't think the men from Munich have done too badly. Crucially, at the wheel of this thing, you know still know you're driving a 3 Series: just a rather different one. On to engines, which as expected are exactly the same as those offered on conventional 3 Series models. Most customers will want the 2.0-litre diesel engine, offered in 150 and 190bhp states of tune in the respective 318d and 320d models on offer. Go for the 320d and you get an xDrive 4WD option. There's also a TwinPower Turbo six cylinder diesel engine, offered first in the 258bhp 330d, which also comes with the option of xDrive 4WD. There's also a 313bhp 335d xDrive variant at the top of the diesel range. If you're looking at petrol power, you'll find that again, the emphasis is on a single 2.0-litre engine offered in different guises. The 184bhp 320i manages 62mph from rest in 7.9s, while the new 252bhp 330i improves that to 6.1s and has to be artificially restrained at 155mph. I can't really see why you'd want to go faster than that in this car, but for those likely to be seduced by six cylinder power, there's a thirsty twin turbo 3.0-litre 340i model at the top of the range. With 326bhp on tap, this delivers the 62mph sprint in 5.1s. All these figures are based on setting up your car in its fastest form, selectable through the 'Sport' and 'Sport+' modes on the standard Drive Performance Control system you operate via this centre console button. This is able to tweak steering feel, throttle response, stability control intervention and, if you've an auto gearbox, gearshift changes based on your preference. As usual with any niche product, there are plenty of people who don't get the point - and most of them have come out of the woodwork and said so in the reviews you may have read of this car so far. Personally, we can't see that the concept behind it is so very difficult to understand. Personally, I've got a family with three children and I'd like the idea of compact, rear-driven BMW if I could find one that was spacious and versatile enough. Here, at last, is that car. Here too is a Gran Turismo BMW model you could actually call stylish. The arcing silhouette and elongated tail see it sitting 81mm taller than an ordinary 3 Series model and of course it's longer, even than the Touring estate. Changes to the outside of this improved version are subtle; smarter adaptive LED headlamps feature with an altered grille surround, the air intakes are revised and there's a new full LED rear light design. Inside, extra chrome and glossy materials for the air vents and dash aim to lift the ambience. BMW's improved Professional Navigation system is also available, with a redesigned menu and Bluetooth as standard. Otherwise, it's much as before, so once raised, the hatch reveals a commodious 520-litre space. So much for the packages. What about provision for people? Well this is where the critics who simply dismiss this as 3 Series with a hatch have failed to do their homework. BMW has done more than just shove in a slanting tailgate here, redesigning the floorplan of this car around a wheelbase 110mm longer than that of the saloon. And nearly all of it benefits rear seat occupants. I'll make no bones about this: I feel cramped in the back of an ordinary 3 Series. Here it's very different, with proper space for three and leg and headroom to spare. You'll pay a £1,650 premium over the cost of a 3 Series Touring estate if you want to own this 3 Series Gran Turismo model - which means asking prices that largely lie in the £30,000 to £40,000 bracket. At the foot of the line-up, there's a £1,400 premium to graduate from the petrol 320i to the 318d. Personally, though, I'd want to find another couple of thousand or so to graduate to mid-range level where the diesel 320d is priced from around £33,000. You seem to get more performance by selecting the petrol option but you get less torque - less pulling power - so in the real world, you'll probably get places quicker in the diesel versions. It'll be hard to justify stretching to the only six cylinder petrol Gran Turismo model, the twin turbo petrol 340i: for a £5,000 premium over an equivalently-specced 330i variant, it gets you to 62mph less than half a second quicker. The other models all have something to be said for them and whichever you go for, it's worth finding another £1,500 to add the 8-speed automatic gearbox: it suits the character of the car. If you want the extra peace of mind of xDrive 4WD, you'll need the 320i petrol variant: here there's also a £1,500 premium to add if you want the extra grip. For this improved nodel, fresh tech such as wireless smartphone charging, a WiFi hotspot and BMW's Connected Drive services has been added, plus the Apple CarPlay system. Once you've swallowed the upfront asking price, you should find this 3 Series Gran Turismo very cost effective to run. Thanks for this can be given to BMW's suite of EfficientDynamics tweaks, which includes all the usual features: Brake energy Regeneration, low rolling resistance tyres, efficient Servotronic electric power steering and a stop/start system to cut the engine when you don't need it, stuck at the lights or waiting in traffic. Plus this GT model's active rear spoiler also plays its part, as does the efficiency-orientated 'ECO PRO' setting in the Drive Performance Control system. This car is even clever enough to use sat nav data to operate the car's ancillaries as efficiently as possible. As a result, the diesel models in particular can return some exemplary figures. The 318d for example manages 61.4mpg on the combined cycle and a CO2 reading of 121g/km. Go for the pokier 320d variant and those figures fall only marginally to 60.1mpg and 125g/km, not bad for a car that gets in 62mph in 7.8 seconds on the way to 143mph. Petrol people of course will need to set their sights a little lower but both 320i and 330i variants still manage around 47mpg and a CO2 reading of around 140g/km in auto form. You'll need deeper pockets to run the twin turbo six cylinder 340i petrol model though: here the figures fall to 40.4mpg and 161g/km. You can see why BMW had to build this car. With Audi proving the need for a five-door bodyshape in the compact executive segment and key markets like China and the USA proving distinctly lukewarm to estates, a hatchback 3 Series seemed the obvious answer. In contrast to its Ingolstadt rival though, BMW has gone further than simply adding a rear hatch to its existing saloon model. It's tried to do something a bit cleverer than that. Raising the ride height and giving the car a more commanding Crossover-type feel has given this car wider appeal without too many dynamic downsides. Those who object to the slightly vaguer feel probably shouldn't be buying this model anyway. It is, after all, supposed to be the 3 Series for families. Ultimately, it all depends what you want. I wasn't totally sold on BMW's 'Gran Turismo' concept in 5 Series form but I'm rather more convinced this time round. It may not be the 'ultimate driving machine' but then it doesn't have to be. In terms of versatility, it's the ultimate 3 Series. For many, that'll be all that matters.